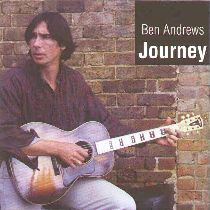 "Journey" is Ben Andrews' eagerly anticipated follow-up to last year's critically acclaimed "Stones In my Passway." This time around it is nearly all covers, but the choice is an interesting mixture of the obvious ("Baby Please Don't Go," "Candy Man" and so on) and the not so obvious, such as "Talking Casey"--one of only two slide guitar ballads written by Mississippi John Hurt--and Blind Willie McTell's "Love Change Blues." Andrews understands the traditions of the blues, and puts his knowledge to good use in "Hambone," which he assembled from a collection of traditional lyrics, and the excellent "Jumpin' Rag" which sounds just like it was written at the turn of the century. Although these are the only two originals, Andrews often arranges the older songs to inject his own particular twist. So, for example, he introduces new lyrics on "Candy Man," and beefs up Woody Guthrie's "Vigilante Man." Most of the album is recorded solo, with Andrews using a variety of instruments which he begged or borrowed for the recording session, since his were stolen en route from Washington, DC to the UK. It was all recorded live, so there's no magical trickery or overdubs here. This includes the three tracks where Andrews is joined by Steve Weston (harp) and Geoff Shaw (bass)--from West Weston's Bluesonics--and you would be hard pushed to tell that they had never previously met. Andrews is equally adept whether the styling be Delta blues, or the more intricate fingerpicking of the Piedmont style. Just for good measure, and by way of variation, the three tracks recorded as a trio, exude more of a Chicago influence. The last of these ("Ain't No Need") closes the album. I have to admit to being confused, because although the words are right, the tempo seems to be slightly out, sounding more like "My Babe." It is still very good, nonetheless. Ben Andrews is currently one of the finest acoustic blues guitarists on the go. Last year's "Stones In My Passway" was always going to be a hard act to follow--Blueprint magazine rated it 10/10--"Journey" is a very worthy successor. If you like your blues acoustic, with plenty of fingerpicking, "Journey" may be just what you are looking for. It is only a matter of time before Ben Andrews picks up a Handy award. Highly recommended. This review is copyright © 2000 by Gordon Baxter, and Blues On Stage, all rights reserved.